IN THE YEAR 2000 Amrit Tuladhar, the fourth generation member of the Tuladhar family that owns Muncha House, went to live with his paradigm-changing Muncha.com. Since then, Kim Smith and Akshay Sthapit have come up with Harilo.com; Manohar Adhikari with Foodmandu; Nikita Acharya and Kiran Timsina with Urban Girl; Prabal Saakha with Hamrobazar. Nepal’s cyber landscape has changed a lot since 2000. According to Nepal Telecom Authority’s Management Information System, internet penetration rates in 2015 were at 46 per cent; approximately 12,199,276 people in Nepal were using some form of data or internet service that year, compared to the estimated 150,000 users, and 30,000 internet and email subscribers in 2003. Thus, unlike when Tuladhar started Muncha.com, e-commerce today is primed to take off. In the last few years, there has been a substantial increase in the number of commercial online websites that are meant to make Nepalis’ everyday shopping experience and transactions easier. Want to go shopping? Check. Want to transfer money to an account? Check. Want to search for a job in Pokhara? Check. There are websites to help you with almost anything you want. Nepali e-commerce companies have now developed operation models that work for Nepal, constraints and all. In 2000, having a website was all in rage. All around the world, dotcom websites were going public. Amazon was one of the first major players in this market, and for Muncha, Amazon’s model was most definitely the benchmark to aspire to. Tuladhar remembers interacting with the internet for the first time in 1995, as a college student in the US, with an email system that allowed students from different colleges to communicate with each other. The whole thing was incredibly new, but it took some time before he began to try and understand the possibilities of the internet. “It wasn’t until 1997, after coming back to Nepal, that I started really looking into the internet,” he says, “which is when the usage price here had dropped to Rs 8 per minute.” Since Tuladhar already had market access with his family’s Muncha House, it was just a matter of putting two and two together before he started Muncha.com, as a platform for selling their products in Nepal. Only after going live with his website did he realise that they were perhaps way ahead of their time—for Nepal. But it was already too late as he had already started, and Tuladhar had no choice but to wait for the market to mature—in particular for an enlarging of the e-user base and for there to be a way around the absence of a credit-card economy. The biggest challenge for nepali e-commerce companies was building a culture of trust. Today—with the growth of electronic payment delivery services such as e-Sewa and Muncha’s iPay (for those that have opted for e banking provisions), and the popular cash-on-delivery model in place (for everyone else)—sites such as Muncha.com are doing great business. In a country where most people don’t have credit cards, and only a minuscule number have debit cards, e-commerce vendors have had to rely on other methods to carry out transactions. E-Sewa and I-Pay have been admirable stand-ins for shoppers in our non-credit card market, and the cash-on-delivery system which has been adopted by almost all e-commerce companies has been working pretty well. Foodmandu is one such business that has benefited greatly from the cash-on-delivery system. 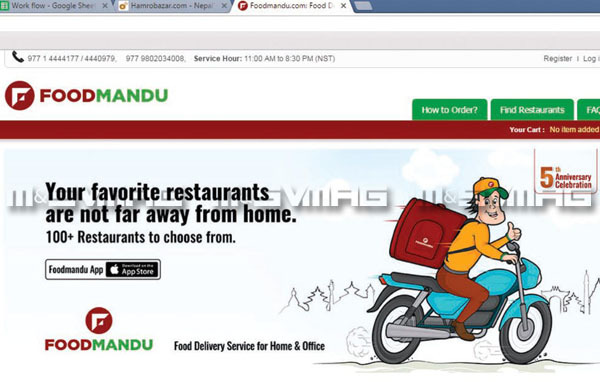 The basic idea of Manohar Adhikari’s Foodmandu is this: If you want to order something from a restaurant no matter where—at home or at the office—Foodmandu will deliver the food to your address for a nominal delivery fee, while they get a percentage commission from the restaurant. 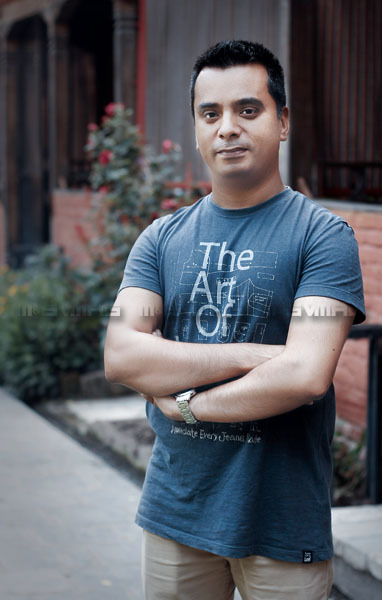 Adhikari was working as a software developer in 2004 when he and his colleagues struggled to find a place to eat near their office." In 2010, he came up with the idea for Foodmandu when he was brainstorming ideas for an e-commerce company. 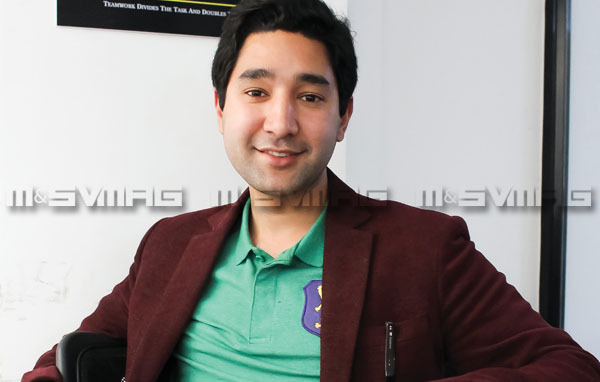 Delivery has always been a problem for online retailers," says Muncha.com’s Tuladhar. “When we first started, if someone abroad had sent something to their family here, they had to come to Muncha House in New Road to pick it up. That was very inconvenient,” he says. Today for deliveries around the country, Muncha.com makes use of both their iPay system and cash-on-delivery. Now, the company has more than 30 delivery channels around the country to ensure that they operate smoothly outside the Valley as well. Furthermore, because there has been an explosion in the number of smartphone users in Nepal, e-commerce operators hope to reap windfall gains from orders placed through the phones. Smartphone SIM-ownership numbers have increased, especially in recent years, at a staggering pace. In 2013, for example, smartphone SIMs were at numbers equivalent to 75 per cent of the Nepali population; by the end of 2015, there were more smartphone SIMs in the country than there were people. According to the NTA, around 96 per cent of Nepali smartphone users access the internet through their phones. But growth and numbers not withstanding, the biggest challenge was building a culture of trust. Building a consumer base trusts the retailer to deliver products that aren’t counterfeit, that are new and not tampered with was quite the challenge for Urban Girl, run by Nikita Acharya and Kiran Timsina. The popular online shopping site’s concept was to provide an online platform for young girls to purchase fashion accessories or clothing, or even baked goods. Initially, Urban Girl approached existing stores in Nepal and asked if the stores would feature their products through the stores’ platform. But no one could really comprehend the concept of their service. Eventually, Timsina and Acharya imported their own products. However, the problem still remains; it has been very difficult for them to convince their customers that the products Urban Girl imports are a hundred per cent authentic. Foodmandu too, had trouble building trust with not only customers but also the restaurants they wanted to deliver from because most of them didn’t believe in their idea—that the concept of something like Foodmandu could actually work in Nepal. “To make sure our customers happy, we accept returns if they aren’t satisfied with the product,” says Acharya. Perhaps as the online shopping culture proliferates and even more, Nepalese will learn to trust the vendors more. The cash-on-delivery transaction model has been a godsend for many nepalis who want to make things easier for themselves. 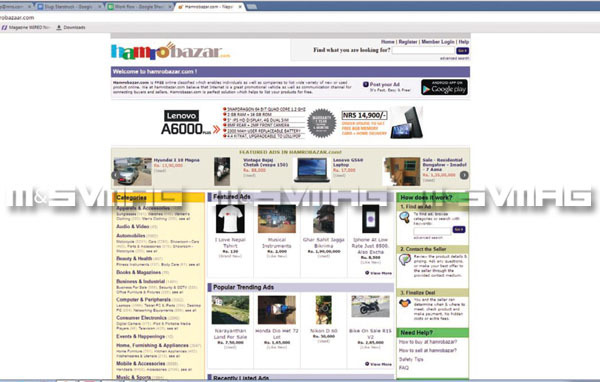 With Hamrobazar, an online classified site, customers had a hard time understanding how the site worked. “It’s one of the simplest e-commerce models,” says Hamrobazar’s founder and managing director, Prabal Saakha. “If you want to sell something, you just have to upload your advertisement, contact your sellers, meet each other and complete your transaction. Hamrobazar is simply a place for you to meet your potential customer—it’s a listing site.” Since the site does not make money from the listings, Hamrobazar uses third-party advertisements (Google ads and vendor ads) as their source of revenue. And because of the ease of transaction it offers, now more and more customers are making use of the platform. Hamrobazar has today become the go-to site for everyone from techies looking to snag a good deal to people looking to rent an apartment or scope out the properties up for sale. Still, e-commerce operators say, the growth could have been much better in the recent past. Even when given the constraints mentioned earlier, which are faced by vendors in India too, the growth should have happened much earlier. That’s because, e-commerce operators say, Nepalese are usually conservative shoppers. Most are not early adopters of technological trends and many take time warming to the possibilities offered by online platforms. This might perhaps account for why although Muncha.com started as early as Amazon—which ought to have given it a first mover’s advantage— has not been as big as it could have been in the Nepali market. It’s a problem that many of the e-commerce ventures deal with, especially in their early days. But in times they are gradually changing—even though somethings remain the same. The e-marketers of today have learned to see the strange situation of Nepalis’ changing some aspects of their behaviour, while holding onto others—not as a problem but as an opportunity, and it is the cash-on-delivery system that the vendors have been able to turn to, to cater the quirks of the Nepali populace. The pace of life in Nepal’s cities keeps getting faster by the day, and for Nepalese who want to keep good pace with their city’s changing lifestyle, the e-commerce companies know that their platforms can be of great help. In Kathmandu especially, most people are leading busier lives, and more people—at a young age—have started settling for office jobs; and with more vehicles clogging Kathmandu’s streets, more of the city’s denizens have to suffer through traffic gridlock each day, except for holidays and weekends. In such a milieu, the cash-on-delivery transaction model has been a godsend for many Nepalese who want to make things easier for themselves—by placing their orders online and having stuff delivered to the place of their choosing. Sites like Foodmandu and Hamrobazar have been the beneficiaries of that trend. The cash-on-delivery system used by today’s e-vendors also works well to counter many of the problems of the Nepali marketplace and to work around the notions that Nepalese buyer have of the products that are sold in the local market. Nepalese know that the market is flooded with products whose quality is suspected and that only some of them will pass muster—upon close inspection. 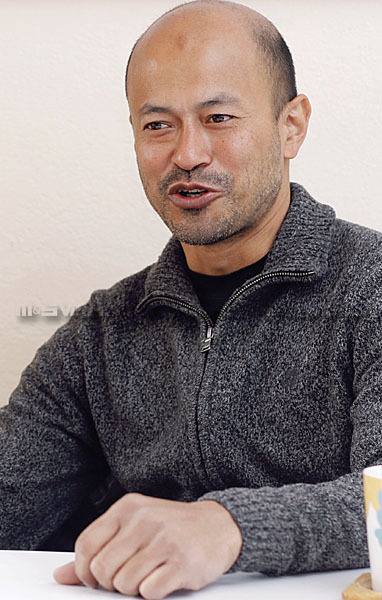 A pre-pay transaction model would not work in a market such as Nepals', which according to Sasto Deal’s founder Amun Thapa is one where buyers still have not shed their need to examine a product with their hands, to ascertain its quality and fit by examining it up close. 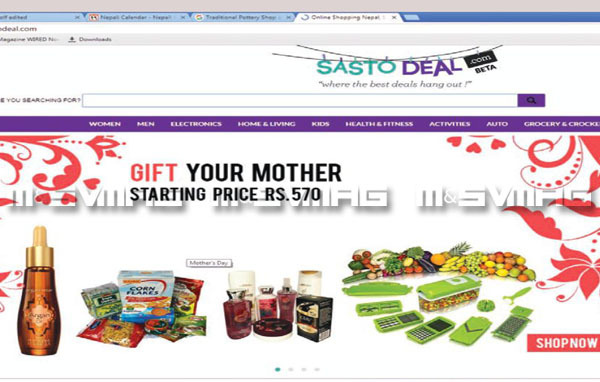 Thapa’s Sasto Deal taps into Nepalese need to find good deals on a plethora of products. The average Nepali shopper knows that haggling is a way of life here—that the price of most products can be brought down quite significantly in some cases by a good round of back-and-forth with a vendor. What Sasto Deal has done essentially is haggle with vendors, on behalf of the buyers. If the company sees a product that they know buyers will covet, they will approach vendors who have the stuff in their inventory and create a deal wherein the price will be driven down. The vendor and Sasto Deal will end up making a profit on volume-sales of the item, without the buyer’s getting the short end of the stick too. It’s a win-win for everybody. Today, there are quite a few new entrants to the e-commerce sector who sees win-win possibilities in the Nepali market. 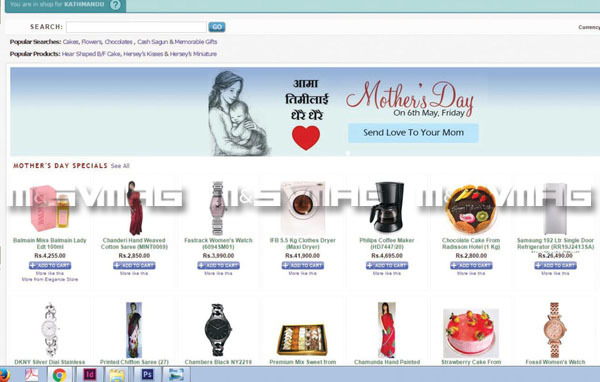 Kaymu, for instance is an aggregator site of sorts that features the products of other vendors. Customers to the site save themselves the hassle of scouring many shops to buy the product of their choice. And the vendors, who partner with the site, do not have to pay huge overheads at expensive retail spaces to gain the visibility they need. Metrotarkari.com, another newbie, deliver products to your door. And even Bhatbhateni, the brick-and-mortar behemoth, have an online portal. The dream that Muncha.com’s, Amrit Tuladhar had in 2000 has finally seen the light of day. His company today is doing orders of magnitude more business than it used to during his phase of struggle. But with so many new market entrants raring to go online soon, the e-commerce competition in Nepal has just started to heat up. Which can only mean good times for the customers.